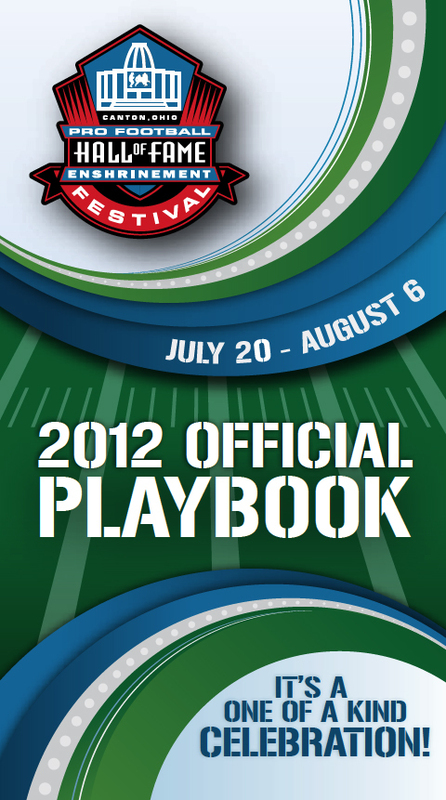 In addition to the printed copies of this year's Official Playbook, a digital copy is available online at www.ProFootballHOFEF.com/official-playbook for easy reference, download or printing. The brochure is referred to as the Official Playbook because it contains comprehensive information about each of the 19 events comprising the 2012 Enshrinement Festival, highlights the 2012 Class of Enshrinees, including Jack Butler, Dermontti Dawson, Chris Doleman, Cortez Kennedy, Curtis Martin, and Willie Roaf, and outlines details of The “Future 50” Project, the $27 million expansion and renovation at the Pro Football Hall of Fame, which will be completed in time for the 50th anniversary of the Hall and Enshrinement Festival in 2013. Continuing a tradition first started in 1977, the 2012 commemorative pins are also currently available, designating the 2012 Pro Football Hall of Fame Enshrinement Festival as a “One of a Kind Celebration!” While this year’s pin is only $4, it could be worth much more for some lucky customers. Thanks to the generosity of McDonald’s • Siegfried Enterprises, Inc., each 2012 pin comes in an envelope with a prize entry form. GRAND PRIZES include: $300 in American Express gift cards from CharterOne Bank; commemorative item from the Pro Football Hall of Fame; complete car detailing service from Sure-Fit Auto Care Center; 10 three-foot party subs from J & K Subway (valid in Stark County); a pizza-per-month for one year from Pizza Hut; a gift basket of Pepsi products from Pepsi Beverage Co.; and a commemorative Enshrinee football and stein from the Pro Football Hall of Fame Enshrinement Festival. In addition to these prizes, the pin envelope includes coupons from various businesses for food and entertainment discounts. Entry forms must be completed and returned to the Canton Regional Chamber offices by 5 p.m. on Friday, Aug. 10, 2012. Mailed entries received Saturday, Aug. 11, or later are not eligible. Winners will be drawn and announced on News-Talk 1480 WHBC AM on Tuesday, Aug. 14, between 7 and 8 a.m. No purchase is necessary to win. For a complete list of rules and regulations or to request an entry blank, contact the Enshrinement Festival office at (330) 456-7253. For Enshrinement Festival ticket and event information, visit www.profootballhofef.com. The current and many past year’s pins can be purchased at the Enshrinement Festival office at the Canton Regional Chamber of Commerce, 222 Market Avenue North, along with a variety of other souvenirs and gift items, including golf shirts, t-shirts and caps. These items will also be available for purchase at all Enshrinement Festival events. ABOUT THE ENSHRINEMENT FESTIVAL In 2012, the Pro Football Hall of Fame and Enshrinement Festival will mark the 49th anniversary of honoring the legends of professional football, which includes conducting a world-renowned festival celebrating the annual enshrinement of football players, coaches and contributors into the Pro Football Hall of Fame. The collaborative efforts of this leadership team, combined with the professional staffs at the Canton Regional Chamber and the Pro Football Hall of Fame, and the dedicated team of more than 4,200 volunteers, will ensure the success of 19 diverse events over two weeks from July 20 to Aug. 6, 2012. The Enshrinement Festival activities, attended by nearly 700,000 people, are expected to produce an economic impact of over $31 million for the Canton/Stark County area and $56 million for the State of Ohio. In addition, millions will experience aspects of the Enshrinement Festival as events are televised and covered by other media. The central focus and highlight of this year’s Enshrinement Festival will be the Aug. 4 Enshrinement Ceremony for the 2012 Class of Enshrinees, comprised of cornerback Jack Butler, center Dermontti Dawson, defensive end/linebacker Chris Doleman, defensive tackle Cortez Kennedy, running back Curtis Martin and tackle Willie Roaf. 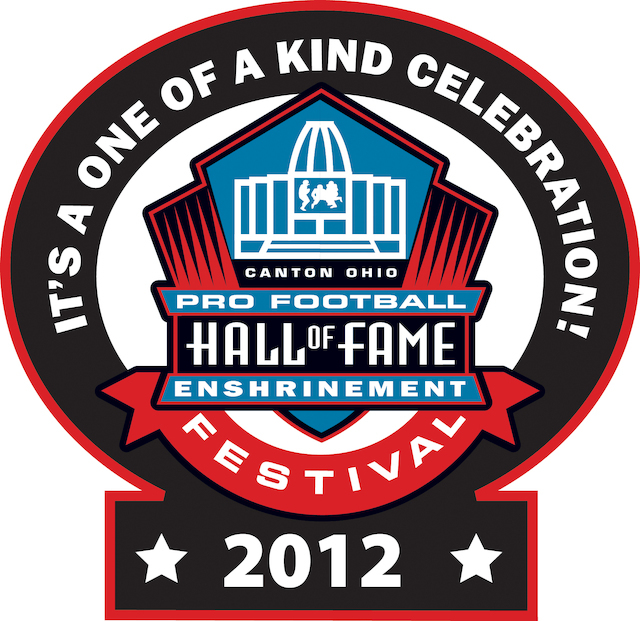 For the complete schedule of events, ticket information, and latest news, check the web sites periodically: www.profootballhofef.com or www.profootballhof.com.